My friend and I were researching simulations of a perfectly fair, 50/50, coin flip type game. We wanted to know what was the maximum number of steps required for a given side to become perfectly even with the other side. For example, let’s choose the heads side. If the first decision was tails (T), and the next decision was heads (H), then it took two steps for H to be even with T. Another example: Given the following sequence, TTTHTHHH, it took 8 steps for H to be even with T. Knowing the maximum number of steps to be even may help place constraints on an suitable progression capable of winning the set. The variation in the maximum-steps-to-even (max-steps) when the number of coin flips is fixed arises because the value is dependent on the particular sequence of random results. On the surface, the results appear to suggest that in any given set of coin tosses, one side is always able to become even with the other side within that set, regardless of the number of flips. However, upon closer inspection, one realizes the significance of the fact that as the data set becomes larger, so does max-steps. This is because the larger set allows for a greater frequency of longer groups of streaks of the other side. Another way to think about this is to realize that the boundaries of each set are entirely artificial and illusory. For example, consider the last 2B set with max-steps of 671,615,400. Within that 671+ million steps are many multiples of 2 million. 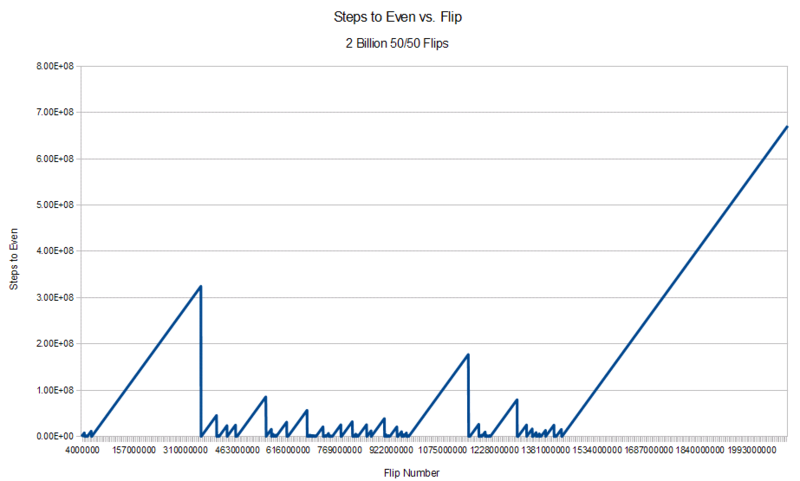 In other words, had we tested 2 million flips within any of those 671+ million steps, we would have obtained a full 2 million as the result for max-steps for that set, which means it never actually reached even due to the simple fact that the set ended before it had a chance to do so. This is a graph of the number of steps-to-even as a function of flips for the same 2B set considered above. It is clear from the graph that max-steps occurs at the very end of the set, and thus the value does not truly represent what interests us. In and of itself, the value is deceptive, due to the artificial end of the set. We don’t actually know how many steps it will really require to return to even, because we have come to the end of the set. Certainly, a larger set will provide more room for the value to resolve, but again, the larger set may have its own unresolved value, requiring yet an even larger set, and on and on, ad infinitum. Likewise, when people report that the world-record for the longest Banker streak in baccarat is 27 in-a-row (or whatever the record is now), we need to appreciate that this value has meaning only in the context of a single shoe. In and of itself, this fact does not say anything definite about how often Banker might streak, because in reality, the boundaries of a baccarat shoe are entirely illusory. It would be pointless to design a progression around the fact that no Banker streak has ever surpassed 27 in-a-row, because that particular number actually is meaningful only within illusory boundaries. For example, consider all those shoes which end in 14 Bankers in-a-row, and begin with 14 Bankers in-a-row. In the context of a single shoe, 14 Bankers in-a-row is far less than 27, so it doesn’t come close to qualifying for a world record and might even be regarded as a relatively common occurrence, certainly at least more common than 27 in-a-row. But what if those two shoes came back-to-back? Then you effectively have 28 Bankers in-a-row, which would beat the world record. It would also beat that 27-level progression that you had thought was infallible. To your bankroll, 14 Bankers in-a-row in back-to-back shoes is more lethal than 27 Bankers in-a-row in a single shoe, but only the latter makes it into the record books. Thus the illusion persists that no one ought walk through walls. This entry was posted on February 15, 2011 at 12:38 am and is filed under Life with tags 50/50, artificial boundary, baccarat, back to back, banker, boundary, coin flip, coin toss, decision, even, even bet, even chances, game, heads, illusion, illusory, math, maximum steps to even, number, player, program, programming, progression, random, sequence, set, shoe, simulation, spins, streak, tails, walk, walls, world record. You can follow any responses to this entry through the RSS 2.0 feed. You can leave a response, or trackback from your own site. What a great article! People should never pay for a gambling system again, if they read this and truly understand it. If a 50/50 game can not be beat, then how can a game with a 1.06% and 1.24% disadvantage be beat? @LuckoftheIrish – Thanks much, you are much too kind, and you are absolutely right! So, how many back to back shoes end and begin with 14 straight banker wins, hmmmmmmmm????????????? @soxfan – LOL, well the short answer is: more than the number of shoes with 28 Banker’s in-a-row.